When my girls, Sarah and Ivey, were little they loved to have sleepovers....especially at our house! They each went through times when they did not want to sleep away. Even when Honey and Pa invited them to spend the night, there was a short period of time that they would not go. Mike and I would be so excited to have a free night and not have to pay a babysitter but they would not go. That was ok because I remember not wanting to leave my mom at times. One night, Sarah and Ivey slept over with my friend and her four children who often played together. Sarah and Ivey were around 5 and 3 years old. Around ten o’clock, Sarah called saying that Ivey was homesick and I needed to come and get them. When I got there I was greeted by Sarah, who hugged me like we had been apart for days. Ivey was not ready so I went upstairs to get her. She said she was staying and that Sarah was the one who wanted to go home. She did not like Sarah’s plan. Once Sarah got home her restlessness left and she went right to sleep. Restlessness is the inability to find rest. It is silent and destroys many people. I think often times it goes unaddressed for years or a lifetime. Being restless affects all parts of our lives and it can wreak havoc on our relationships, marriage, work, etc. It can hinder our personal and work performance. It will steal our peace and joy. When we are in that frame of mind it can cause us to make bad decisions in life and relationships. Physical restlessness is when we have sleepless nights. Although we may desperately need and want sleep, our bodies will not let us. Relational restlessness is when people go from person to person and place to place searching. It is an uneasiness with themselves. We do not stay happy for long. It cannot be cured with purchases, people, achievements, activities, busyness, etc. The solution to restlessness is rest. 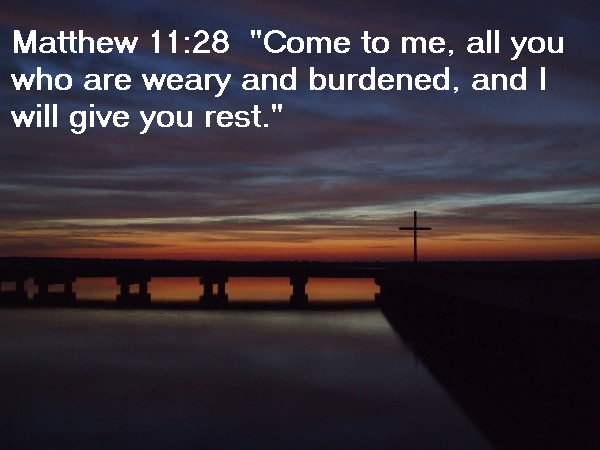 Matthew 11: 28, " Come to me, all you who are weary and burdened, and I will give you rest." As I read my small group introduction the word "restless" was used. One of the chapters in the book was, "When Others Don't Like Our Plans" which really spoke to me. A few years ago I found myself feeling restless and unsettled. For me restlessness brought tears and they were coming often. I knew what the issue was and I did not feel I could do anything about it. The tears came because my soul was not settled. I was agitated on the inside. I tried to listen to my body and not suppress things that caused added stress. This issue was a big deal to me and was causing stress. I had identified the problem, but was not ready to take a leap of faith and go where God was calling me. I think the tears came from frustration that I knew I was made for more. I also think the tears were coming because I was wrestling with God. Years prior, my dad told me that the tears would stop when I quit fighting God and made the commitment I was struggling with. He had been right. I recognized the restlessness as God calling me for more. People that I respect told me I could not do this and I listened. They also told me why I could not do it. Proverbs 18: 3, "If one gives an answer before he hears, it is his folly and shame." Of course they did not understand. They had not heard what God had told me. I realized it was time that I just listen to God and remain in His truth and be attentive to His voice. You know the saying, "you can run, but you cannot hide" - well that is especially true with God! That is why staying busy and running won't work. I was tired of running. God continued to call me. As soon as I acknowledged - not just knew - that it was God calling me, I was able to start chatting with Him. I told Him all of the reasons why I could not do this. As if He did not know already, He patiently let me talk. He did not debate with me. He let me know this was no longer open for discussion....just like a parent to a kid! Like Sunday school, He left me with one question to take with me. In that question, He pinpointed the very thing holding me back!! It was time to trust God - not others. Proverbs 3: 6, "Trust in the Lord with all your heart, and do not lean on your own understanding. In all your ways acknowledge him, and he will make straight your paths." After all He wants more for me! Jeremiah 29: 11, "For I know the plans I have for you,” declares the Lord, “plans to prosper you and not to harm you, plans to give you hope and a future." Pray, trust and wait. Psalm 62: 1, " Truly my soul finds rest in God;..." God wanted more for me and I knew it meant I had to make some changes! God can not renovate when we are unwilling to making a change! Fast forward a year and a half! God is faithful beyond belief! He gave me just what I asked for and so much more along with lessons in trust, God's timing, and being obedient!